Basil (Ocimum basilicum) is noted as one of the most frequently reported plants used as medicine. No doubt some of your favorite dishes have Basil to thank for their amazing taste! It’s been used for centuries as a food additive. But did you know that you can use Basil essential oil as a beneficial supplement that helps your body. It’s impact on the nervous system allows for a calming effect that helps to balance and calm the adrenals, muscles, and nerves. As an added bonus you’ll discover that this Basil essential oil is a great one to use first thing in the morning to chase away the sleepy fog or to calm the anxiousness which comes from an overwhelmed state of mind. Dilute 1 drop with 3 drops of carrier oil. Put in a capsule and take 1 daily. does not contain any ingre dient of animal orgin or derived from animals. -Egg, un pasteurised egg and egg products. PLYCYCLIC MUSK: Does not contain any polycyclic musk. Antibacterials: Antibacterial effects of essential oil of basil, as well as basil extracts, against both Gram-positive and Gram-negative bacteria have been shown in vitro by other authors (6;​8;​10;​12;​13;​15;​35;​36;​162). Based on laboratory study, Ocimum basilicum (aerial parts and essential oil) showed promising antibacterial activity against Salmonella spp., Enterococcus spp., Pseudomonas spp., Escherichia coli O157, Campylobacter jejuni, and Clostridium perfringens (4;​163). Anticoagulants/antiplatelets: In in vitro and animal research, basil oils inhibited platelet aggregation (51;​52;​53). Antifungals: In vitro, the essential oil of basil, as well as the constituent linalool, had antifungal effects (16;​17;​22;​25;​164;​170). Antilipemics: In animal research in a hyperlipidemic model, an aqueous extract of basil reduced total and LDL cholesterol, as well as triglyceride levels, while HDL cholesterol was increased (50). In vitro, an ethanolic extract of basil reduced LDL oxidation and macrophage accumulation of lipid droplets (165). Antineoplastics: In a cell line study, sweet basil (Ocimum basilicum L.) oil showed some antiproliferative activity with an IC50 value of 0.0362mg/mL in P388 cell lines (57). Antioxidants: In a study of patients with chronic bronchitis, exposure to essential oils of basil caused lowering of plasma levels of dienic conjugates and ketons and activation of catalase in red cells, which are characteristic of antioxidant effects (63). Fractions of basil leaf were examined for antioxidant effects in vitro (40). Constituent antioxidants were found (phenolic compounds and flavonoids), and antioxidant effects were shown in various in vitro assays, such as iron (III) reduction, the ferric-reducing antioxidant power assay, alkylperoxyl-scavenging assay, and the 1,1-diphenyl-2-picrylhydrazyl (DPPH)-scavenging assay (40). Antioxidant- and free radical-scavenging effects of basil and its constituents (e.g., rosmarinic acid) have been shown in other in vitro studies (44;​45;​46;​48;​49;​177), including nitric oxide inhibition (178), inhibition of Ikappa-B phosphorylation (179), stimulation of antioxidant enzymes (hepatic glutathione reductase, superoxide dismutase, and catalase), and reduced glutathione (180). Antiparasitics: In animal research, basil essential oils and their constituents had antiparasitic effects against Trypanosoma cruzi epimastigote and bloodstream trypomastigote forms (38). Basil essential oil, and its constituents such as linalool, also showed antigiardial activity (37). Antiulcer agents: Fixed oil of basil had antiulcerogenic effects against alcohol-induced gastric ulcers in rats (30;​95). Antivirals: Several laboratory studies have been conducted investigating sweet basil's antiviral activity; however, each study posited different compounds responsible for its antiviral effects, including water-soluble polar substances, apigenin, linalool, and ursolic acid (54;​73). No activity was noted for carvone, cineole, beta-caryophyllene, farnesol, fenchone, geraniol, beta-myrcene, and alpha-thujone. Cholinesterase inhibitors: In vitro, basil and its major constituents had inhibitory effects against acetylcholinesterase (AChE) and butyrylcholinesterase (BChE) (166). Fertility agents: In in vitro research of human spermatozoa, sweet basil had potent spermicidal action (93). In one study, it was found that oil of cinnamon showed the highest activity, followed by eugenol, clove oil, oil of basil, oil of ajowan, oil of peppermint, and dill. 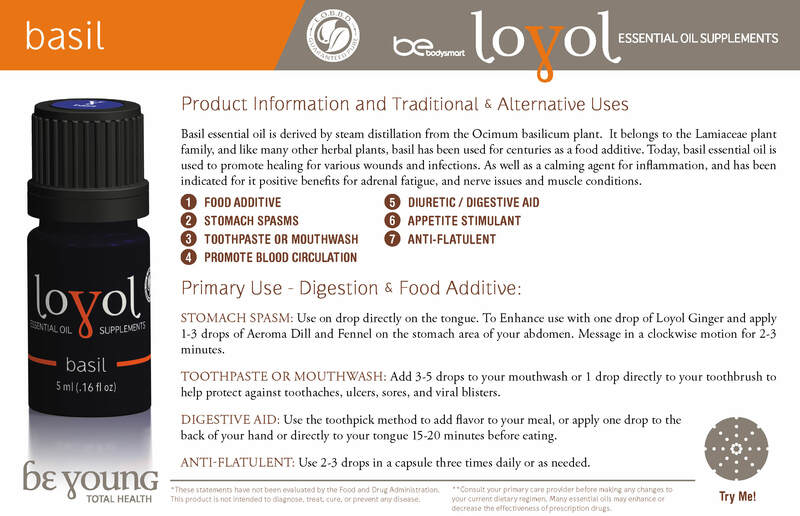 Gastrointestinal agents: In animal research, fixed oil of basil inhibited castor oil-induced diarrhea (30). Hepatotoxins: According to laboratory study, estragole (4-allyl-1-methoxybenzene) and its metabolite, 1'-hydroxyestragole (1'-HE), are hepatocarcinogens in rodent models (146). In theory, drugs and dietary components that are UGT2B7 and/or UGT1A9 substrates may interfere with estragole metabolism. Hypoglycemics: In a rat epididymal adipocyte assay, basil was only mildly effective on insulin activity (65). Hypotensives: In animal research, a basil extract reduced systolic and diastolic blood pressures (74). Immunomodulators: The role of nuclear transcription factor-kappaB (NF-kappaB) in immunomodulatory effects of basil has been discussed in a review (75). Based on in vitro research, basil inhibited the phagocytosis of opsonized sheep erythrocytes (170). Basil has also been discussed as a natural inhibitor of complement (171). Further details are lacking. Radioprotective agents: According to secondary sources, sweet basil may interact with radioprotective agents. Smooth muscle stimulant herbs and supplements: In vitro, oil of basil had relaxant effects on tracheal and ileal smooth muscles (91). Stimulants: In preliminary clinical research, sweet basil essential oil combined with peppermint and helichrysum alleviated mental burnout and mental exhaustion (127). Topical acne agents: There is preliminary clinical research on the effects of sweet basil essential oil as an alternative to acne antiobiotic treatments that show antimicrobial resistance (172). In a combination treatment with orange (Citrus sinensis), sweet basil essential oil improved lesion counts (127). Topical agents: Based on in vitro skin models, basil oil was a penetration enhancer for various agents (173), including nitrendipine (174), carvedilol (175), and labetalol hydrochloride (176). 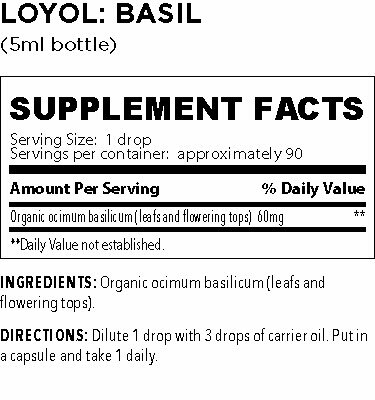 Vasodilators: In animal research, an aqueous extract of basil had vasorelaxant effects (53).